Blood (synonym haematopoiesis) - the process of formation, development and maturation of blood cells: red blood cells (erythropoiesis), leukocytes (leucopoiesis), platelets (trombones). 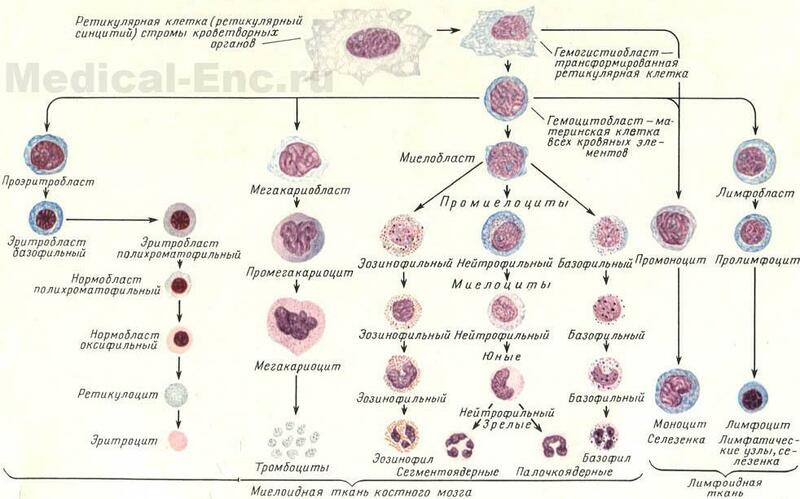 The germ blood begins in the yolk sack; from the 2nd of the month this function takes the liver, and with the 4th month occurs kostnomozgove blood, which by the time of birth completely replaces the liver. As in the liver and bone marrow, the formation of erythrocytes, granulocytes, and platelets. Lymphocytes appear only on the 4th month, when the formation of the lymph nodes, spleen starts to produce only after birth. The red blood cells of the fetus first 3 months - megaloblastic (major nuclear cells, turning upon maturing in large red blood cells - megacity) gradually replaced by normoblasts, giving rise to the normal red blood cells. In extrauterine life megaloblastic (embryonic) type of blood occurs when pernicious anaemia and similar diseases. By the time of birth the fetus is set final nature of blood. The child it is in principle not different from the blood of an adult. Up to 4 years of age limfopoez more active than granulomous, then it is normal for adults their relationship. The ancestor of all blood cells is the primary blood cell - genocidalist (see color table). From it in the bone marrow develop proerythroblast, giving rise to the formation of red, myeloblaste, which are all granulocytes (neutrophils, eosinophils, basophils), monoblastny progenitors monocytes and megakaryoblast, which is the source of clot formation. In lymphoid organs genocidalist turns into lymphoblasts - the ancestor of lymphocytes. There is also another theory, which assumes the existence of so-called stem cells that function as parental cell blood. This concept is functional. Stem cells may be an element, patentnyj to hematopoiesis: reticular, lymphoid-reticular cell, the lymphocyte; genocidalist is considered one of the phases of cell development from stem to Mature blood cells. Of cells retikuliarna stroma of bone marrow formed plasma cells - the cells, along with lymphocytes produce gamma-globulin and play an important role in protecting the body from infections. The maturation of cells occurs at the place of the blood, normally in peripheral blood coming only Mature cells. The cellular composition of blood and blood-forming organs is a system that resides in a healthy body is in dynamic equilibrium that continuously destruction of formed elements is balanced by the corresponding blood. This balance is maintained by a complex regulatory mechanisms. On the blood influence of Central and vegetative nervous system, a number of hormones, vitamins and special factors in the blood (see castle factors, Cyanocobalamin). Under pathological conditions certain factors (blood loss, hemolysis, lack of oxygen in the blood, toxins some microbes) stimulate blood, other (lack of iron, factors castle, hypersplenism, radiation damage, toxins, viruses) hinder it.